Twitter sent an email to (some? many?) users Thursday to announce the new profile. An email sent to some Twitter users Thursday morning announced the new Twitter profile and included a link to “get it now.” News about the new profile design broke earlier this month with a slow roll-out to all users, beginning with a select few and as well as any accounts created 4/8/14 or after. 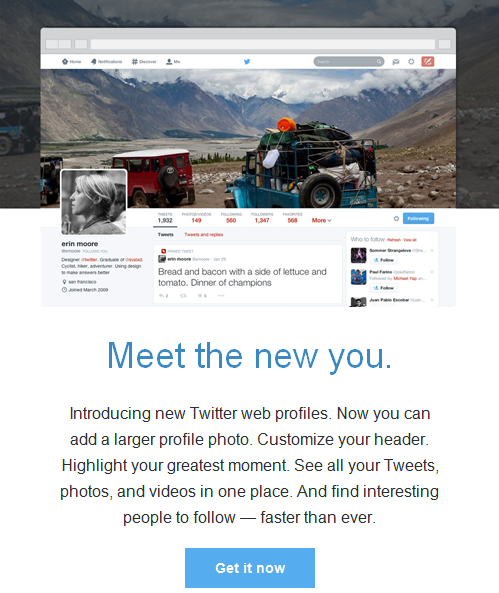 It was unclear when users would be able to update to the new profile design or whether Twitter would notify users. Users logged into their accounts Tuesday April 22 may have noticed a link to update their profiles. According to the Official Twitter Blog, Tuesday was the day Twitter started rolling out the new design to all accounts worldwide. How Do I Get the New Profile Design? If you did not receive an email or see the option to update your profile, click here to get it. What’s New on the Updated Twitter Profile? Read about it here or check out the video below for an overview of what to expect. What if I Don’t Like the New Profile? As far as I can tell, once you’ve switched over, there’s no going back. Here’s an article detailing potential third party apps to display Twitter more to your liking for desktop as well as mobile. One site they mention to use is MetroTwit, however they have discontinued their services. Your best bet (also recommended by that article) is to use TweetDeck. 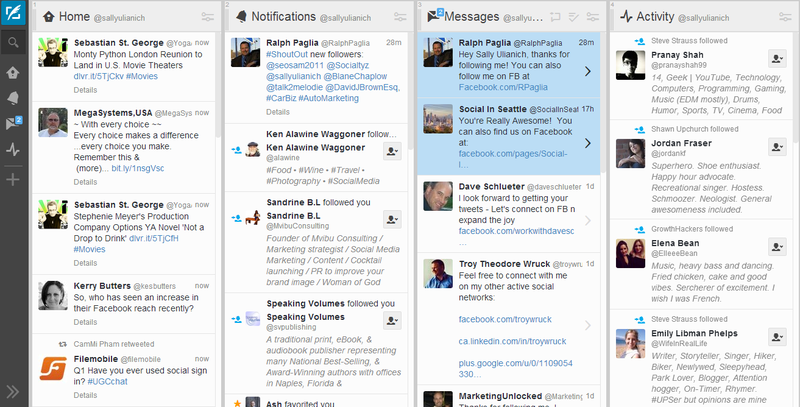 It gives a no-nonsense interface that makes it super easy to see your Twitter feed, notifications, messages and activity all in one place. I will say it made me feel a bit like I was falling with all that information flying down the page, but it’s super clean and very easy to use. And it’s free, so that’s always a good thing! Previous Previous post: How Secure Are Your Devices?